Kat Thorsen is a therapeutic art facilitator and craftivist. She specializes in arts-based programming for at-risk youth and young offenders and her aim is to use art to heal and build connections. 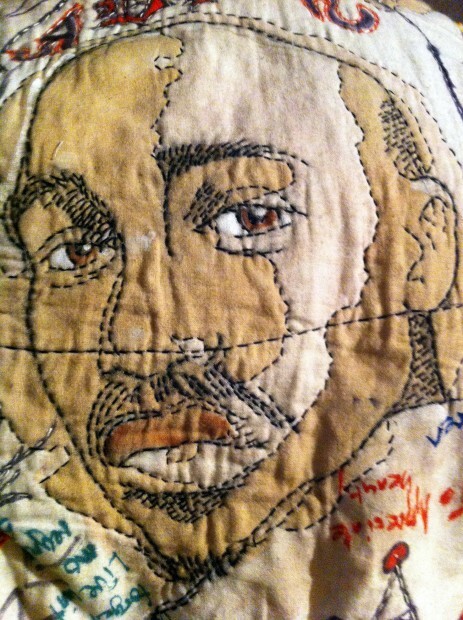 1) The No Censorship Quilt: Starting a Dialogue. Thorsen works with youth in custody and one afternoon she tried to kick-off a group piece by lying a large white sheet on a table, planning to quilt what they drew. It didn’t work. 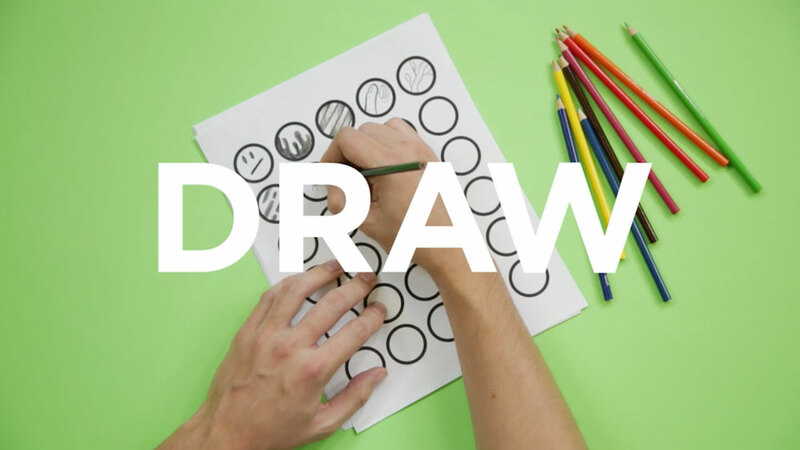 No one drew anything. They tagged the paper, wrote words, and drew on it in felt pen; then the pen was stitched over by Thorsen and some of the boys. Eventually what was once a plain piece of paper became a quilt that was exhibited and then sold on Etsy; the money went for supplies she could use for further volunteer work. Her initial goal of getting rival gang members to communicate was achieved. 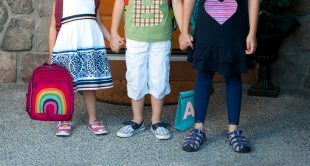 And while, “it didn’t solve anything when they [left] the room,” in the moment, they were to make something together as one – showing how creativity can help us connect with those that are different from us. It is out of this obsession that she began to make sock monkeys for friends and family. So when she started working at an alternative school it was only natural she would return to the craft. She taught them to make sock monkeys, using their creation as a kind of art therapy. 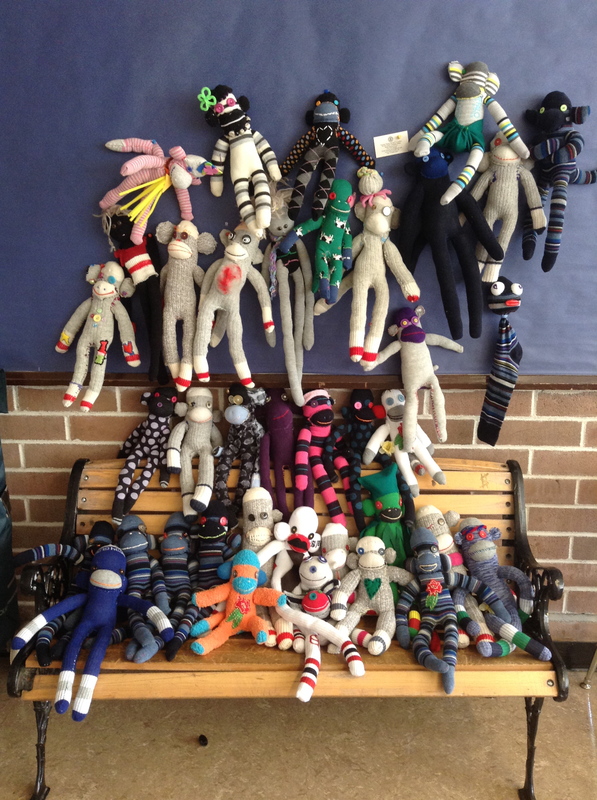 “You could see the transformation, everyone was dialoging and having a good time.” It was then that she came across Operation Sock Monkey founded by Lindsay Hodgson, which makes sock monkeys for charitable organizations to pass out around the world after performances. She asked Hodges if she could make some sock monkeys to help. Hodges said she needed 30, but with the students’ help, Thorsen ended up sending them 200. 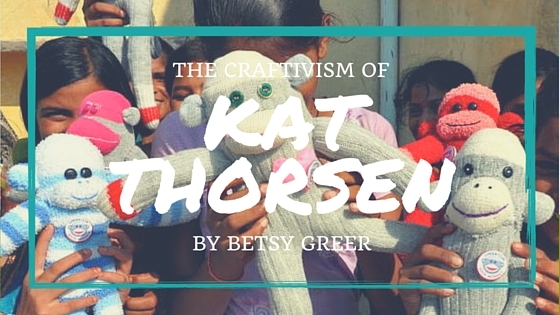 By keying into the fact that the kids were opening up to others as they made their monkeys, Thorsen was able to use crafting to create a sense of safety and offer the kids a non-threatening place to look (their hands) while talking about something rough. 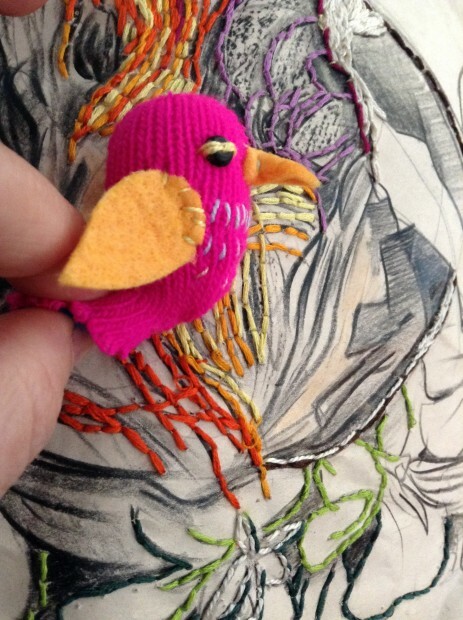 3) Hummingbirds as Memorials: Remembrance through Stitches. Liz Elliott was the founder of the Centre for Restorative Justice in Vancouver, and died quite young from cancer. “In the local aboriginal culture here, 4 years is a very significant moment, and it’s time to let her spirit go.” Four years after Liz’s death, the center held a potlatch, which is part of a First Nations tradition where everyone brings gifts. 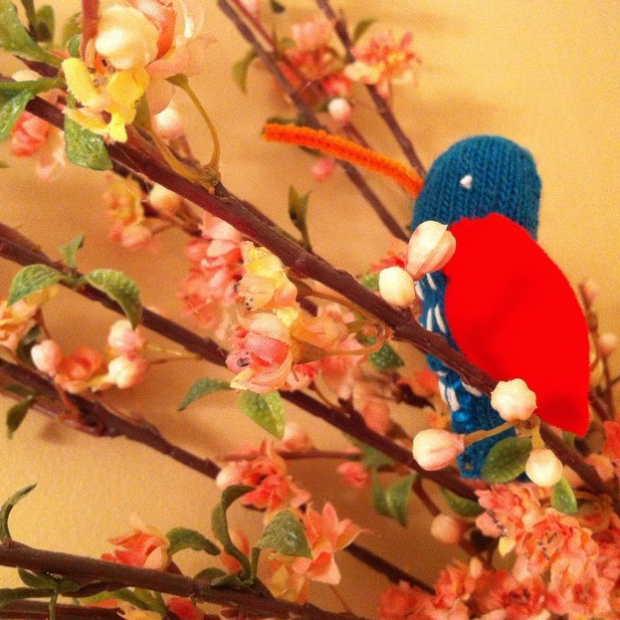 Just before the ceremony, the director of the center called Kat and requested she make hummingbirds. Hummingbirds were Liz’s favorite symbol and via her restorative justice work, had now become a symbol for it. The creation of these tiny birds are a perfect example of how crafts last and hold meaning. By coming away from a potlatch or a workshop, people end up with a tangible object infused with meaning that just doesn’t exist in anything mass manufactured. Currently Kat is involved with a project making 200 sock monkeys for Nepal. 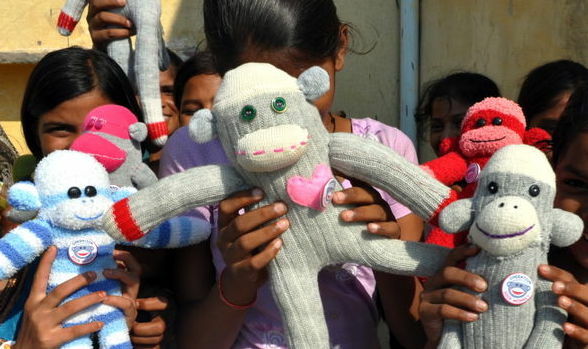 The monkeys will be sold at Christmas craft fairs and the proceeds will go to the Kamala Yonzon Tahrayli Foundation, which is raising money to put in a water pipeline in a remote village in Nepal, saving villagers hours a day by allowing them to obtain water directly in their village. She is also working on finishing her true-crime graphic novel about a long-standing mystery from 1953 in Vancouver that she’s been working on for 14 years, in which all the drawings are embroidered. To learn more about Kat and her work, go to katthorsen.com.